Hakeem Olajuwon was one of the greatest centers to play the game and won two titles with the Houston Rockets during his Hall of Fame career. While big men don't normally receive strong hobby interest, Hakeem Olajuwon rookie cards and other early options remain very popular with collectors. 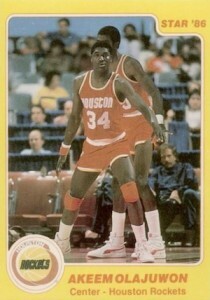 Shop for Hakeem Olajuwon Cards on eBay. A strong force on both sides of the ball, Hakeem Olajuwon joined the NBA in 1984 as the number one overall pick by the Houston Rockets. Despite this, collectors had to wait until 1986-87 for his first official rookie card. However, there are some other early options from Star Company that still see strong interest. After this initial collecting void, Hakeem Olajuwon card options picked up in the 1990s, including his first autographed card in 1994-95 Skybox Premium. Collectors were later treated to the first Hakeem Olajuwon memorabilia card with 1997-98 Upper Deck Game Jerseys. Autograph and memorabilia options for Olajuwon would build considerably from that point on and he is commonly found in current products. The list below highlights the key early cards for Hakeem Olajuwon, including his one official rookie card. 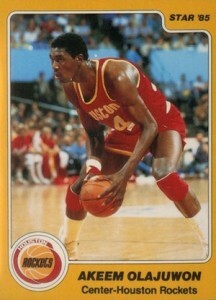 Although 1986-87 Fleer is widely considered to to be the main rookie card for Hakeem Olajuwon, 1984-85 Star holds the distinction of being the first NBA card for "The Dream." Several things weaken the rookie claim, including limited distribution and counterfeit and quality control issues, but the earliest Hakeem Olajuwon card sees good interest and value. There are also several Star inserts for Olajuwon. As can be seen below, all of the early cards list "Akeem" because Olajuwon had not yet changed the spelling of his name to "Hakeem." Not nearly as popular as his first Star card, 1985-86 Star offers collectors the second Hakeem Olajuwon card that pre-dates his official rookie. The bright yellow border does not look nearly as good as the golden border on the 84-85 card. 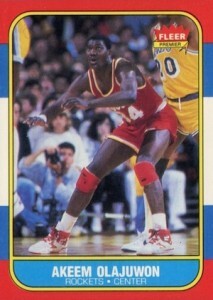 Home to the official Hakeem Olajuwon rookie card, 1986-87 Fleer is one of the most recognizable sets in the hobby. While low- and mid-grades are largely inexpensive, Gem Mint copies normally sell for $700+. 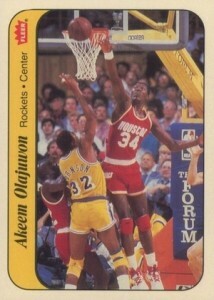 Also found in 1986-87 Fleer, this early sticker insert shows Hakeem Olajuwon battling Magic Johnson at the basket. While the main rookie is not too pricey, the sticker is a nice budget alternative and ungraded copies can regularly be found for around $5. 2006-07 SP Game Used Hakeem Olajuwon Legendary Fabrics Autograph 38 50 SSP!!!! !